About You: I was graduated from art university of Tabriz last year and now I am working for the hooba design studio in Tehran as a designer. As it is understood from the topic, the purpose of designing was to create a fun and amicable atmosphere for the children to learn. We have removed all the borders and class divisions that are usual in nowadays school and instead of that we have merged the learning spaces by defining different zones on the basis of the age of the children. Learning process occurs in different spaces that have different qualities in both outdoor and indoor clusters. Individual learning spaces have been considered beside the collaborative learning zones and we have considered some separate open courts for each learning zone that will help to the learning process to be continued and expanded in these courts (yards). These exclusive courts are connected to each other and despite their specific function, they also connect different learning zones to each other, in other words, we have a dynamic interaction between open and closed spaces that was made possible by these courts and the roofs enhanced it as well. 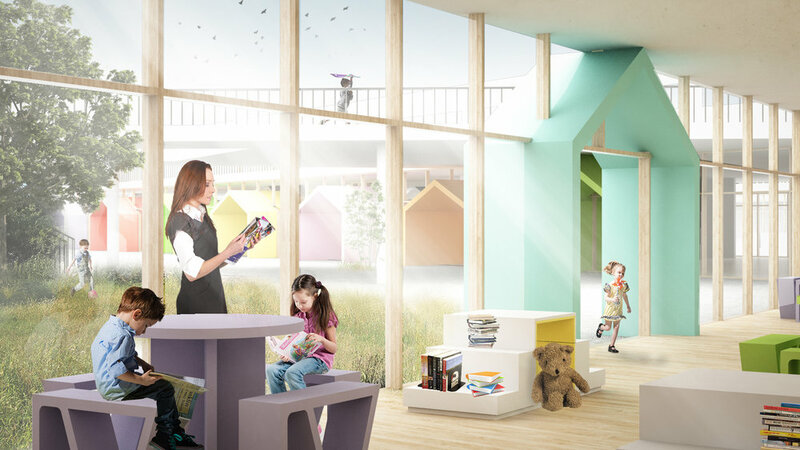 The learning zones have been designed in a way to help the collaboration between children from different ages. 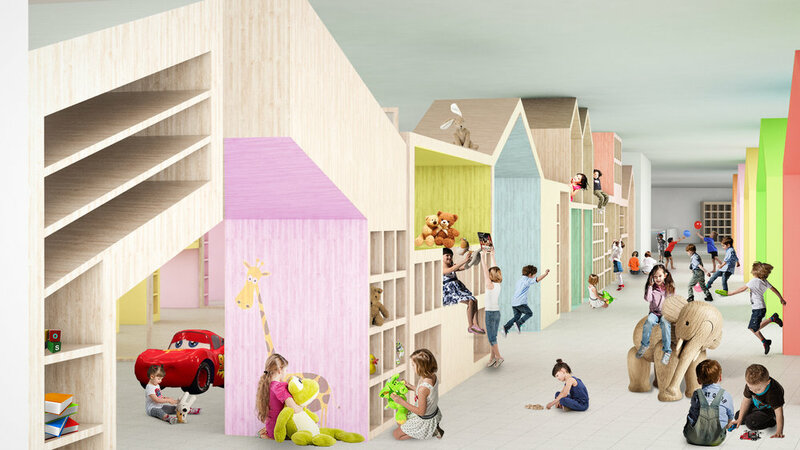 These learning spaces provide a fun and interesting atmosphere to learn and play in terms of flexible furniture and different fun colors for the interior. The learning zones are flexible and transparent so we can merge them together into bigger or smaller spaces for different purposes. All the spaces provide a different experience to the students, we have achieved this by applying fun colors, designing a dynamic form and creating rich visual interaction between different spaces. The transparency of the form perfectly responds to the visual appeal of the children and the vast views to different zones enhances this point as well.